We eat a lot of carbs in our house. Even though I follow a gluten free diet my family loves baked goods. I normally modify recipes to be gluten free so that I can eat them, but I also occasionally make regular foods that the rest of my family can enjoy. One of the major things that just doesn't taste the same gluten free is bread. Gluten free bread just doesn't have the same texture or taste, trust me I have tried just about every recipe I have been able to find. However, regular homemade bread is delicious and my family loves it. Since I canned homemade jam last night I knew when I woke up this morning that my two boys would demand homemade bread. There is something about homemade jam that just screams for a great slice of bread. Today I tried a new recipe for White Bread from allrecipes.com. This recipe has 6 ingredients. It takes 3 hours of total time, 20 minutes of which is active and makes 36 servings. I only made a few minor changes to the original recipe. First I decreased the total amount of servings to 12 or one loaf. The recipe doesn't specify how long it takes to allow the bread to rise, but in my kitchen each rise takes approximately an hour. If you have never shaped bread the easiest way to do so is to make the dough into a rectangle, fold it into thirds like you would a letter and pinch the seam and sides closed. My two boys devoured almost this whole loaf within a couple of hours. I liked that it was easy to slice and I had no problems with the bread overbrowning since the amount of sugar wasn't too high. The loaf came out looking nice and the dough was easy to work with, which is nice since some recipes are harder to work with than others. Overall, this is a nice basic bread recipe that would work well for people that have no bread making experience. For the recipe go to White Bread. Thanks :) My boys really loved it! This looks like a wonderful bread recipe. I love to bake bread! I love baking bread too, it's so relaxing and tastes yummy! There is nothing on earth like homemade bread. Especially when it's fresh out of the oven. Heaven. I agree, fresh out of the oven bread is the best! That looks so good. There's nothing like a fresh yummy loaf of bread. Thanks :) I agree there is something so delicious about fresh bread! Followed you back, thanks for stopping by! We don't have a bread machine but my girls have been dying to make bread. And oh my, I'll bet that was good with the homemade jam! I want to make bread tonight but it's too hot. Don't want to heat up my home. Is that your loaf? OMG mine looks so amateurish. That is my loaf :) I understand about not wanting to heat up the house, it's too hot and humid here too! Dear Ann, With the price of white bread where it is, it is healthier and much less expensive to make it at home. I know most will say it takes too long, but really it is worth it. I agree. I haven't bought store bread in years. In part because it's too expensive and I hate that so many brands use high fructose corn syrup, no thanks! Thanks for the sweet comments! I don't know how to bake homemade bread but my mom does and she makes the best homemade bread ever. Well I think all kids say their mom does the best whatever ever! Anyway, I remember eating them when they first came out the oven, there's nothing like hot bread with some butter smeared on it. Back then it was all done by hand and no recipe. Thinking about it now makes me want to have some. Hot out of the oven is the best, I agree :) The bread that I normally make I don't follow a recipe since I have made it for years. I only follow recipes when I am making new recipes and dishes. I normally change a bunch of things we well! I am horrible at baking. It is one thing I wish I was better at. Maybe I'll give this bread recipe a try and hope it doesn't come out like a brick (like all of my other attempts at baking do)! Homemade bread always looks so delicious! I have had bread turn out like a brick before too :) It happens to all of us! 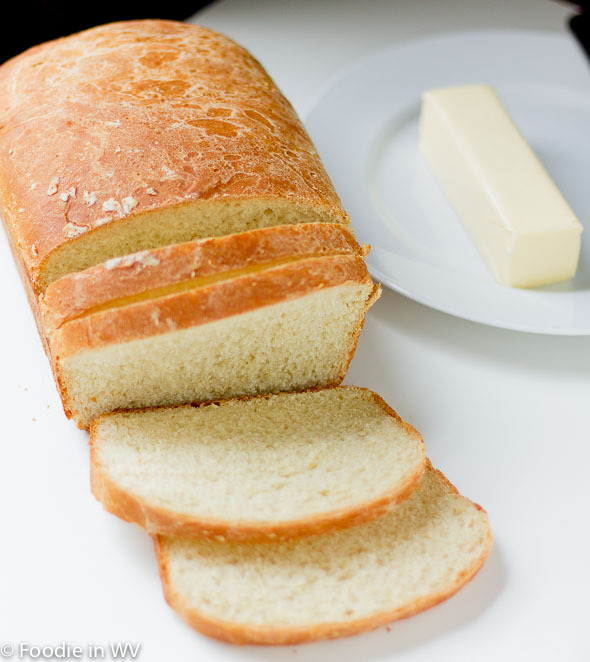 One of my best memories is coming home from school and smelling the freshly baked bread my dad made. I'm going to try your recipe! I'm a new follower through the Meet and Greet Hop. Come visit at Blue Plate Sundays. Nothing like the smell and taste of home made bread. Lightly toast it and spread with butter. Yum. I agree, homemade bread toasted with a little bit of butter is delicious!